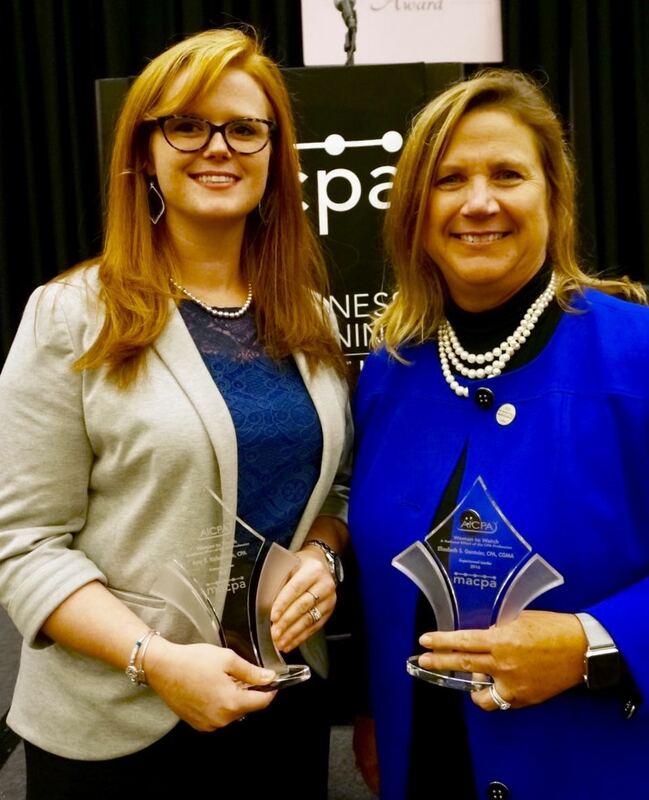 Amy Richardson, CPA, and Elizabeth Gantnier, CPA, CGMA, have been recognized as Maryland’s 2016 “Women to Watch” by the Maryland Association of CPAs. The MACPA’s annual Women to Watch awards highlight the accomplishments of Maryland women in the CPA profession and demonstrate to emerging female leaders that success is not out of reach. The awards, initially created by the American Institute of CPAs, lead to important conversations about diversity and inclusion and highlight the resources that are available to CPA firms and companies. The “Emerging Leaders” award recognizes up-and-coming stars in their organizations. The “Experienced Leaders” award goes to those who have advanced to the highest levels of management or ownership in their organizations, and by mentoring those following in their footsteps. Richardson (at left in the photo), an assurance supervisor in the Baltimore office of RSM US, is the MACPA’s 2016 “Emerging Leader” award-winner. A member of the RSM team for more than five years, Richardson says she aims to deliver the RSM brand — “The Power of Being Understood” — to clients on every engagement. She lives and breathes her motto — “Put yourself out there and get involved” — by being personally involved in the recruiting, training, mentoring and development of future RSM leaders, and by giving back to the Baltimore community through volunteer efforts and service projects. Gantnier, the professional practice partner for the mid-Atlantic region at Dixon Hughes Goodman, is the MACPA’s 2016 “Experienced Leader” award-winner. Gantnier has served the CPA community for more than 30 years in a variety of roles, most recently by overseeing the merger of Stegman and Company and Dixon Hughes Goodman. Gantnier is a nationally recognized CPE instructor for the AICPA, Fortune 500 companies, and state CPA societies. She is the immediate past chair of the Maryland Board of Public Accountancy and volunteers on numerous committees for the AICPA, the Center for Audit Quality, and the Public Company Accounting Oversight Board. Emerging Leaders: Nancy Buckley of Hertzbach and Company; Kelly Bugg of Biegel and Waller; Caroline Jiang of Arthur Bell CPAs; Kimberly Spacek of Dixon Hughes Goodman; and Mandy Wheat of RSM US. Experienced Leaders: Diana DeWitt; Tricia Griffis of Frederick County Government; Betsy Johnson of PricewaterhouseCoopers; Sylvia Lagerquist of Haines and Lagerquist CPAs; Edith Manney of the Community Action Council of Howard County; Susan Nelson of MedStar Health; Marilyn Schneider of Hertzbach and Company; Eileen Sherr of the AICPA; and Karen T. Syrylo. This year’s Women to Watch awards breakfast featured a keynote address by Richard Caturano, chair of the AICPA’s National Commission on Diversity and Inclusion. Caturano served as the AICPA’s chair from 2012 to 2013 and is a partner and national leader of culture, diversity and inclusion at RSM US. Dr. Jan Williams, a professor of accounting and director of the Accounting Honors Program at the University of Baltimore. Williams was a 2015 Women to Watch award-winner in the “Experienced Leader” category. Jennifer Elder, a thought Leader for the Business Learning Institute and president of The Sustainable CFO. Elder was a 2015 Women to Watch award-winner in the “Experienced Leader” category. Jennifer Milas, senior tax manager at McLean, Koehler, Sparks and Hammond and a 2015 Women to Watch award-winner in the “Emerging Leader” category. Michelle Chopper, director of Advisory and Consulting Services at Arthur Bell CPAs and a 2015 Women to Watch award-winner in the “Emerging Leader” category. Amy Vetter, global vice president of education and head of accounting at Xero. Accounting Today magazine has named Vetter one of the 100 most influential people in accounting.